It can take a while to get your head round the quirks of academic writing, particularly when you’re trying to research, take notes and put together a structured argument in your essay or thesis at the same time. Struggling to get the referencing right can seem like the last straw. When you’re faced with institutional guidelines to referencing and online generators, it can be hard to see the wood for the trees. It’s not often made explicit, but there is one basic premise behind in-text referencing for Harvard which goes a long way to clarifying how you should present your sources. 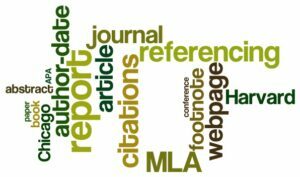 Essentially, the in-text reference is a pointer – a quick link to the full source detailed in the reference list at the end. Whatever you put in your in-text reference – usually author’s surname, but sometime organisation name for an online source – should correspond exactly to the opening term in the final reference list, which determines where the reference is positioned alphabetically. Proofreaders correct references day in day out. If you’re uncertain about your presentation, a proofreading service can save you a big headache. If you need your help with your referencing OR you require any editing services such as proofreading, copy editing, document formatting, then visit www.proofers.co.uk today!